A retirement income plan is a year by year timeline that shows you where your retirement income will come from. It can be done on a sheet of graph paper, or quite easily in an Excel spreadsheet (or another spreadsheet program). Here are four easy steps you can use to make one. Start your retirement income plan with one row for each calendar year, with your respective age (and if married spouse’s age) listed next to each calendar year. Extend this projection through life expectancy. You can see a sample retirement income plan on the table at the bottom of this article. Make column headings for each item you will add to it. Use the list below to determine what items to add. Your Social Security - Show the amount starting in the year/age you plan to begin benefits and continue this life expectancy. In the sample at the bottom of the page you see at their age 66 there is half a year of Social Security, as this person plans to start on their 66th birthday which is in the middle of the year. Your spouse’s Social Security - Show the amount starting in the year/age you spouse will begin benefits and continue it through their life expectancy. If there is an age or health difference between the two of you keep in mind that upon the first death, the surviving spouse keeps the larger of their own Social Security or their spouse’s. This means if one spouse has a shorter life expectancy, your retirement income timeline would only include the larger Social Security amount after the expected longevity of the other spouse had been reached. Your pension(s) - Show the amount starting in the year/age you plan to take it. A separate column is used for each source of pension income. Your spouse’s pension(s) - Show the amount starting in the year/age you plan to take it. A separate column is used for each source of pension income. If married, make sure you account for the pension survivor option that was chosen. Annuity Income - Input this only if you have an annuity that will pay you a guaranteed minimum amount starting at a specific age or date, with the payment continuing for life, joint life, or for a set period of time. Earnings - If you plan on working part-time, input earnings for the year you plan to work. Don't forget, if you take Social Security before full retirement age and have earnings in excess of the earnings limit, your Social Security will be reduced, so you may need to reduce what is in the Social Security column based on your expected earnings. Other - Input any other fixed or regular sources of income such as rental income or alimony. One time sources of income - input expected lump sums, such as life insurance proceeds, an inheritance or net proceeds from the sale of a piece of property. Do not input investment income sources such as dividends, interest, or capital gains. Instead, you will use your retirement income plan to calculate how much you will need to withdraw from your financial accounts. Next, estimate your total annual living expenses. List items such as a mortgage that may be paid off in a few years in a separate column. In the example at the bottom of the page you see the mortgage will be paid off halfway through 2025, so that year the total annual mortgage payment is half what it was the year before, and then that expense goes away. Tax rates will vary depending on your total income and deductions. It is best to do tax planning each year to accurately project this. In the example I am using, this person only has IRA savings. Any withdrawal they must take will have to come from their IRA and will be taxable income. 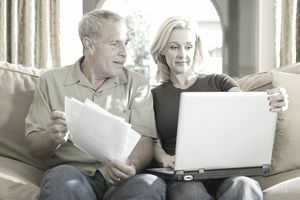 They worked with their tax planner, and used their retirement income timeline, to estimate that they would need a gross $35,000 IRA withdrawal at their age 66, which is their first planned year of retirement. Of that withdrawal, about $3,100 will go to taxes. The following year they will have more Social Security income and estimated they would only need about a $15,000 IRA withdrawal. Their tax planner estimated their tax liability would be about $3,300 that year. They used that number for the remainder of their projection. Next, your retirement income plan should calculate the gap, which is a deficit to be withdrawn from savings, or a surplus available to be deposited to savings. In our example add up income sources (Social Security plus pension), then subtract expenses (living expenses, mortgage, and estimated taxes) to get to the -$34,693 shown in the first row under the column labeled "Gap". If this "Gap" is a negative number, this is what you would need to withdraw from savings and investments to have your desired retirement lifestyle. If the "Gap" is a surplus then you have enough fixed sources of income to meet your desired retirement lifestyle and could add to savings or possibly spend a little more. This simplistic retirement income plan does not account for inflation or investment returns, but it gives you a starting place; a year-by-year outline of where your retirement income may come from. Once you have this pattern of projected withdrawals you can use it to create an investment plan that is customized to when you will actually need to use your money.